One of the blog posts that I enjoy writing every year is the Top 5 Best Beauty Products and the Top 5 Worst. The post summarizes the products I have tried throughout the year and I narrow it into my Top 5 favourites. This year, I am going to do something different. Instead of showcasing the best, I have options of high-end and budget of the best products. Some of the things like facial wash and serum are worth to invest on the high-end. But things like toner is sufficient to get the budget option. Anyway, I let you decide on your own which one you prefer. The price indicated varies from different point of sale, however it wouldn't much of a difference. These are the products that I find effective and enjoy using. I hope it helps you in deciding which product to get when shopping for skincare. This cleanser removes even the toughest foundation. Because of its 3-in-1 function, this cleanser actually saves a lot of money on makeup remover and scrub. It is a daily facial wash and not harsh on the skin. If you are interested to try this, contact me. I am one of the Beauty Consultant for Mary Kay. The AHA+BHA facial wash comes in tube (cream) and pump (foam) form. There is no difference between the two except the texture form. This is usually my pick if I am lack of budget to purchase the Mary Kay Timewise Cleanser. I find it works really well in reducing black & white heads. It also keeps the face smooth by reducing small bumps. Purchase on Watson. The SK-II FTE is hands down the best essence. Although it was highly raved, it also gives consistent results in keeping your face glowing, healthy, moisturized and slows down aging. Bare in mind that this is an expensive product, however, it is worth it. Treat yourself with a bottle when they have their promotion from time to time. I believe the price is RM199 for a small bottle during the promotion period. Purchase on Sephora. If you haven't tried any Guerisson horse oil products, you should. The cult product Guerisson 9 Complex Cream have been loved by a lot of people, however, I find the texture thick and sometimes too oily. The Guerisson 9 Complex Essence gives the same effect as the cream and the good thing is it doesn't leave the oily residue. Purchase on Amazon. This toner gives a brightening and moisturizing effect at once. In fact you can skip the moisturizer altogether after applying it. For those who need a dose of hydration on the skin should give this toner a try. Purchase on Sephora. I wasn't a fan of rose products until I tried the Mamonde Rose Water Toner and I became a convert. The Mamonde rose toner smooth and your skin feels refreshed immediately. The rose scent makes it feels really luxurious - soothing and calm. Purchase on Althea. Use my affiliate link to register and you will receive RM35 credit. I have previously blogged about this serum with noticeable improvement on my skin within one week. I got the first bottle from Lancome PR, since then I have been repurchasing it with mu own money. Currently, I am using the third bottle. Read the full review here. Purchase on Sephora. Another Mamonde product that I love is the First Energy Serum. The serum contains flower aged vinegar that can help keep your skin preserved the youthfulness. Purchase on Althea. Use my affiliate link to register and you will receive RM35 credit. I think I don't have to introduce the Kiehl's Ultra Facial Cream. This is arguably one of the famous moisturizer in the world. The moisturizer deserves all the praise. It is a simple moisturizer that only focus on restoring the hydration level of your skin. Purchase on Kiehl's. 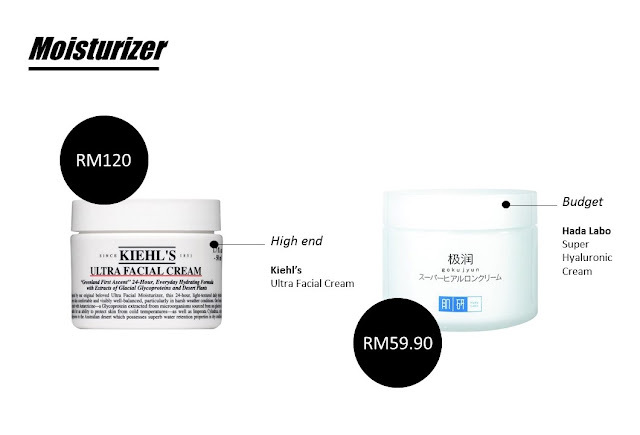 I find the Hada Labo Super Hyaluronic Cream has a lot of similarity with the Kiehl's Ultra Facial Cream. In fact, I have done a comparison of the two products. You can read the differences on the post. Purchase on Watsons. I am a big fan of the SK-II Pitera range because it gives immediate results. The Facial Treatment Mask is no difference. If I am traveling or having a hectic working schedule, I will purchase this. It turns tired and dull skin into refreshed and hydrated skin within few minutes. Purchase on Sephora. b.liv is a great drugstore brand. There are a lot of masks under their range that are pretty good. But I particularly like the Stem Cell Revival Mask because it lifts up sagging skin and smooth out wrinkly area after application. Consistent use of this mask will promote younger looking skin. Purchase on Watsons. Eye cream is probably one of the skincare that is hard to tell its improvement. To be honest, I do not know which eye cream is good. But I know that the Kiehl's Powerful Reducing Eye Cream is by far the best to keep my upper eyelid stay put and reduce sagging around eye area. Purchase on Kiehl's. L'Oreal has been a trusted skincare brand that is pocket friendly. The Revitalift range is good for anti-aging effects. I find the eye cream is pretty strong. It is an eye cream for night use and you can't use it under your makeup. Despite the thick texture and strong effects, it is a product that delivers quick result. Purchase on Watsons. I think it is obvious that Kiehl's is one of my favourite skincare brand. I use this sunscreen on a daily basis. You can read the full review here. This sunscreen is lightweight and has no issue to apply underneath foundation. It contains SPH50 with PA++++ to protect your skin from UVA and UVB. Purchase on Kiehl's. It is hard to find drugstore sunscreen with high-level sun protection. The Senka Perfect UV is probably the only drugstore sunscreen with SPF50 that you can get in Malaysia. It is water-based so it doesn't feel oily and thick during hot days. Also, do you know that Senka is a brand by Shiseido? Purchase on Watsons. Microdermabrasion is actually a professional treatment to remove the dead skins on the top layer of the skin. The Timewise Microdermabrasion is a mild version that is safe to be used at home on a frequent basis. This is a high compact scrub that is very effective in removing impurities in the pores. The scrub granule is also very fine. You can purchase this from me as I am one of the Mary Kay Beauty Consultant. I believe every household has a tube of the St. Ives Apricot scrub at one time. Following the success of their body scrub, St. Ives product a milder scrub for face. The exfoliating beads can be quite rough, but it does what it promises. With the affordable price and immediate results, you really can't find any other facial scrub better than this. Purchase on Watsons. If you are looking to purchase skincare, I hope this post can give you a reference so you won't feel overwhelmed with the different products in the market. Next week I will be featuring another post for makeup products. I am currently compiling the Makeup Showdown 2017 for my next post. If you have any makeup holy grail makeup products to recommend, please feel free to leave me a comment so that I can check out the product. My makeup holy grail products are products from Moonshot. So far, I love their bb cushions, primer, cream paints, lip feat and stick extreme. It can be a little pricey but worth the investment as it has not disappointed me at all. The cream paint, lip feat and stick extreme products are also multi usage depending on the colour. My holy grail eyeliner is the Kat Von D Beauty Tattoo Liner. I hated doing eyeliner until I got a sample of this from Sephora and fell in love with it! It dries quickly and so easy to apply. By the way, if skincare holy grails, currently it will be products from Innisfree and Cosrx, both really helped my skin and both are not too pricey.